Queen’s University is to host a specialised cross-border studies centre examining bio and marine-based power, as part of EU support of almost €10m (£8.9m) to develop renewable energy capacity in the UK and Ireland. The EU funding will be used for projects focusing specifically on wave and tidal power generation at locations including Strangford Lough and the North Antrim coast, as well as ocean energy sites in Western Scotland and the potential for wave and tidal power generation in Donegal in the Republic of Ireland. A massive tidal energy project on the seabed off Northern Ireland’s north coast is planned for 2018. The EU is contributing more than €9.3 million (£8.3 million) from the Interreg programme, while match-funding has been provided by the Department for the Economy in Northern Ireland and by the Department of Jobs, Enterprise and Innovation in the Irish Republic. Welcoming the project Ireland’s Minister for Jobs, Enterprise and Innovation Mary Mitchell O’Connor, said: "I am delighted that my Department is co-funding this initiative together with our counterpart Department in Northern Ireland. The project involves practical cross border cooperation which will benefit colleges and companies from both jurisdictions. Advanced research on Renewable Energy is a very worthwhile project and this work will contribute many benefits, including a long term legacy for the future." The Bryden Centre for Advanced Marine and Bio-Energy Research will be recruiting a total of 34 doctoral students and six post-doctoral research associates to produce research with the potential to yield strong commercial benefit. The project, which represents the largest cross-border research ever, will involve the collaboration of a number of partners including the University of Highlands and Islands, Letterkenny Institute of Technology, Ulster University, the Agri-Food & Biosciences Institute, Donegal County Council and Dumfries and Galloway Council. Gina McIntyre, the chief executive of the Special EU Programmes Body, which manages Interreg, said the project was aimed at tackling the low level of industry-relevant research and innovation in the local renewables sector. "The Bryden Centre project will help address this issue by creating a new centre of competence made up of dedicated PhD students creating high quality research with strong commercial potential," said Ms McIntyre. “This is one of the core objectives of the EU’s Interreg VA Programme as it has allocated a total of €71.7m worth of funding to enhance and develop the research and innovation capacity of businesses on both sides of the border,” she added. Aside from marine energy projects, the Centre will also focus on bio-energy, specifically heat, biogas and electricity which can be produced through the anaerobic digestion of agri-food waste. The Bryden Centre is named to pay tribute to the dedication of the late Professor Ian Bryden, a leading expert in marine renewable energy with a 30 year research career in fields associated with energy and hydrodynamics. This expertise, combined with his work as Vice-Principal (Research) at the University of the Highlands and Islands, means he played an instrumental role in developing the project that now bears his name. The Centre is currently seeking to recruit its first cohort of 20 or more PhD students to commence their studies in September 2017 offering a range of research opportunities in the key areas of Biofouling, Biofuels, Renewables and Environment (Resource, Interactions, Impact), Grid Storage and Techno-Economics. Findings produced are intended to benefit small and medium-sized businesses struggling to become more innovative within the renewable energy sector. For further information on the Bryden Centre please contact Sam McCloskey in the Centre for Advance Sustainable Energy at Queen’s, tel +44 (0)28 9097 4606. 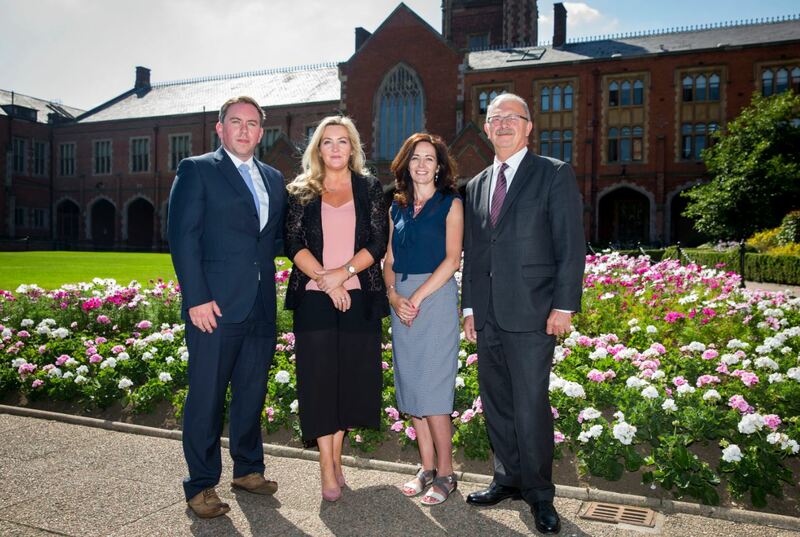 Caption (L-R): Dr Dermot Leonard of Business Alliance, Gina McIntyre from the Special EU Programmes Body, Samantha McCloskey of the Centre for Advance Sustainable Energy and Professor James McElnay, Acting Vice-Chancellor.